A three-day festival of Northumbrian traditions kicked off in Morpeth today. 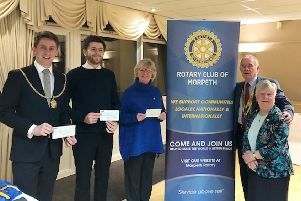 The 48th Morpeth Northumbrian Gathering, which will see some 60 events taking place across the town, was officially opened by Morpeth Mayor Nic Best. The ceremony at Morpeth Town Hall was also attended by the Gathering’s own figurehead, Morpeth Gadgy Alex Swailes, and many of the festival’s performers and participants. Throughout the day there have been art, dance and music workshops, craft activities, exhibitions and singing. And tonight there will be a concert of music hall and peace songs at Morpeth Methodist Church, and a free musicians’ session at the Tap and Spile pub. Other activities over the weekend will include the traditional Saturday morning pageant, re-enactments, competitions, street entertainment and more music, art, craft and dancing. Mayor Nic Best officially opens the Morpeth Northumbrian Gathering in the presence of the Morpeth Gadgy and other participants and organisers.